We would love to fill every page of this Anniversary issue! Have you ever been to the Antiochian Village or has your child? Consider placing an ad with a “blast-from-the-past” photo in the Souvenir Journal – share your memories of the Village – 40 years of summer experiences! Were you a part of NAC Teen SOYO in the past 50 years? Commemorate those personal experiences on the pages of the Souvenir Journal for you and your church friends, and honor the parish that helped shape you and your faith. For those of you whose parents and grandparents supported their churches to raise you in the faith: This is your chance to remember them now, so they’re recognized in the history of the Antiochian Orthodox Archdiocese. Preserve their memory on the pages of the Souvenir Journal. For all of you who make up one church family, why not take a church photo together and tell us your story as a parish or mission, large or small, old or new. It’s a great way to learn of our Sisters and Brothers in Christ across our beloved Archdiocese. The Souvenir Journal pages are an empty canvas for you to fill with heartwarming messages and photographs of people through years gone by and years being well-lived today, in faith, hope and love. 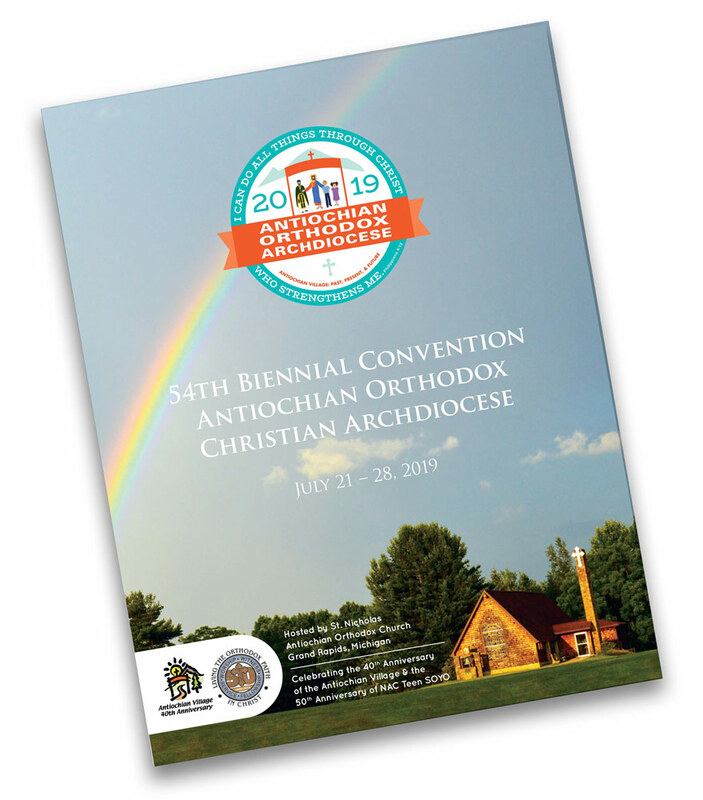 THE DEADLINE FOR PURCHASING AN AD IN THE AC2019 SOUVENIR JOURNAL IS MAY 15, 2019. We ask you to remember that Souvenir Journal ads help offset Convention expenses and allow us to offer programs, speakers and workshops without charging for them. Please click on this link and reserve your spot for one of the pages of the Souvenir Journal. We are hoping that every church is featured! Quarter, half, and full page ads in color or black & white are available. TOGETHER, WE WILL MAKE THE 2019 ANNIVERSARY ISSUE ONE FOR THE AGES! See you in Grand Rapids: You’ll love it here!